Physical therapy can be grueling and difficult. The last thing you want to do is make things harder on your patients by not identifying your physical therapists. "Is this guy a doctor, or my therapist?" is not something a patient should have to wonder at your facility. Badge Buddies eliminate those concerns by clearly identifying your personnel with a color bar and bold, clear text. These Badge Buddies feature a green color bar and white "PT" text, making it abundantly clear that the wearer is a physical therapist. Badge Buddies are designed to be combined with an existing ID credential to create a full ID solution: the Badge Buddy is placed behind an ID card, with both then secured to the wearer using a strap clip, badge reel or lanyard. 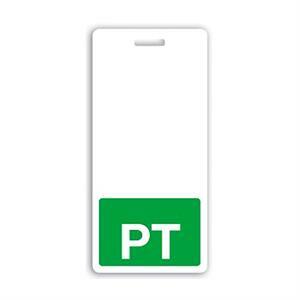 By issuing these Badge Buddies to your physical therapists, your patients will be able to put aside their confusion and focus on one thing: getting better! Badge Buddy measures 2.13" x 4.5"